Volvo has long been known for the safety and reliability of their vehicles, but it wasn’t until the past decade that they’ve really stepped up their design game. 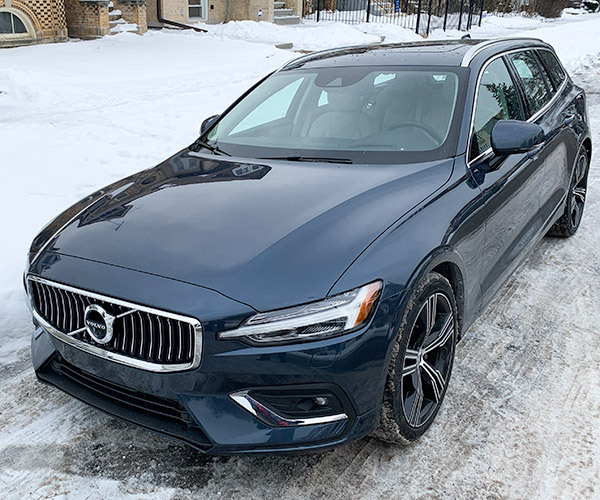 Following in the footsteps of their stellar XC90, S90, V90, and XC60, Volvo is back with another winner – a vehicle that envelops the best of Swedish sensibilities in a single package. 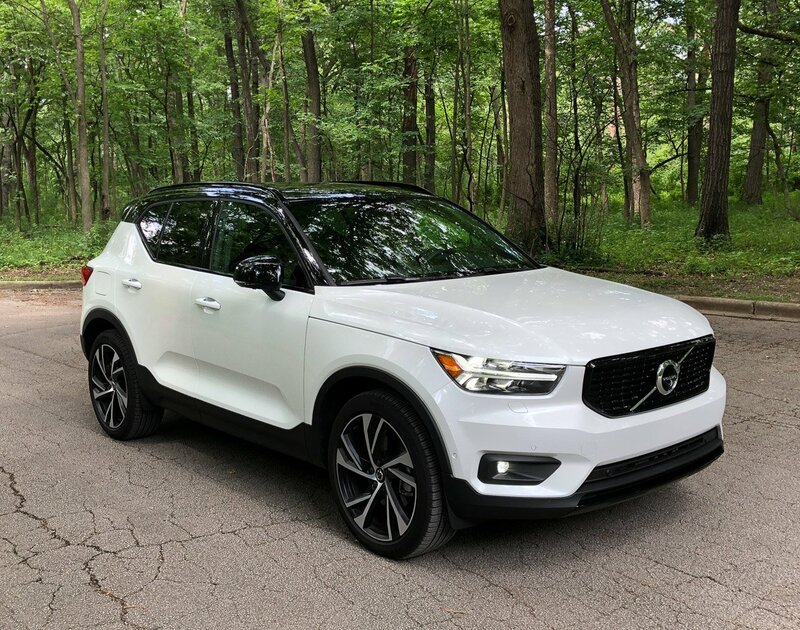 The 2019 XC40 combines pragmatism and modern design in ways that truly set it apart from the crowded compact crossover space. While most of the other CUVs on the market are either bland or quirky, Volvo’s design is just the right mix of sophisticated and playful, while still managing to maintain a broad appeal. I’ve not heard any complaints from my friends or peers about the design of Volvo’s most recent vehicles, and that’s high praise in today’s cynical world. 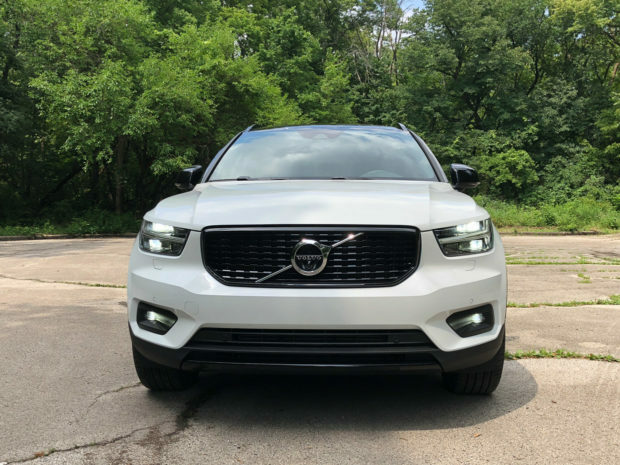 While some other automaker’s trademark looks don’t scale up or down well, the boxy, iconic Volvo grille and bold Thor’s hammer headlamps look great on every vehicle they’ve appeared on to date. 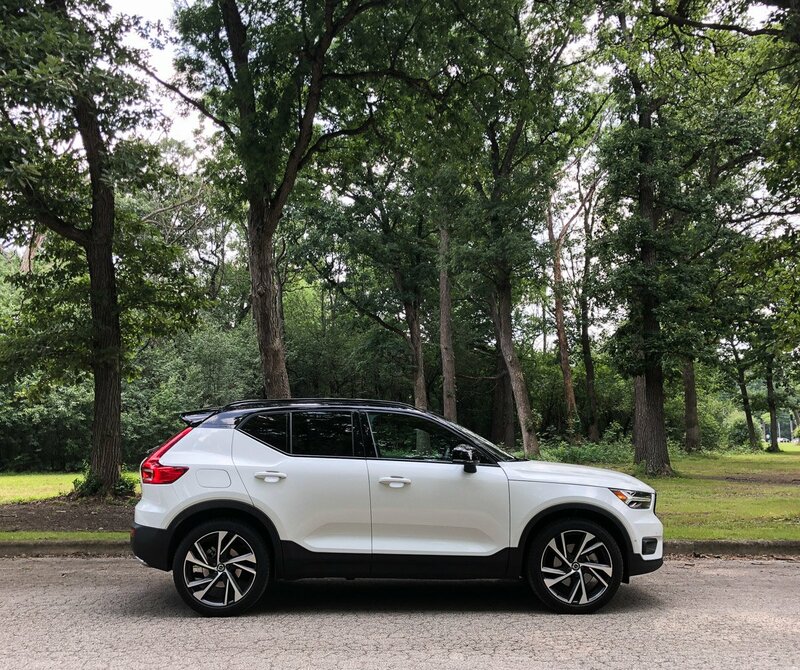 In profile, the proportions of the XC40 are just right. It’s pretty rare that I like the styling of a vehicle from every angle, but whether you’re looking at this little Swede from front, rear, 3/4 angle, side, or even top, it looks brilliant. 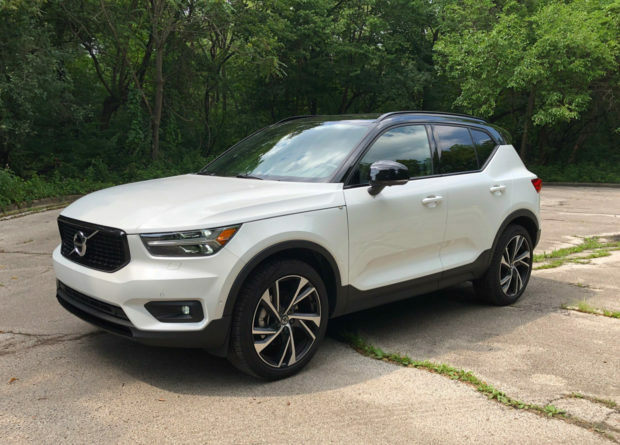 Volvo offers the XC40 in three trim levels, the most conservative and basic being the Momentum, the most tricked out being the Inscription, and the most stylish being the R-Design model reviewed here. From the outside, the R-Design’s most notable features are the gloss black roof and grille, and its slick windmill style 19″ wheels. 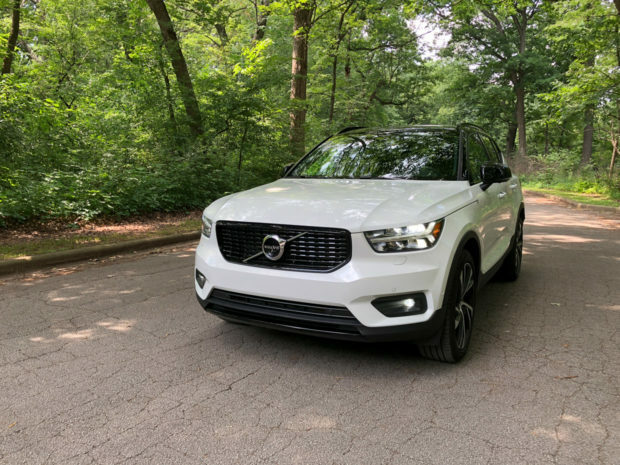 Under the hood, you can get the XC40 with either a 187 hp or 248 hp turbocharged 2.0-liter inline-4, with the T4 model offering up 221 lb-ft. of torque, and the T5 model pushing out 259 lb-ft. The T5 model I drove punches above its class with lots of kick once it gets going. As an added bonus, turbocharger offers up a satisfying woosh as it spools up. There’s just the tiniest bit of lag if you drop the pedal too fast. Still, it feels zippier than most of the other compact crossovers on the market, and I have to wonder if there’s a calculation error in Volvo’s claimed 4,895 pound quoted curb weight, because the XC40 feels anything but heavy. 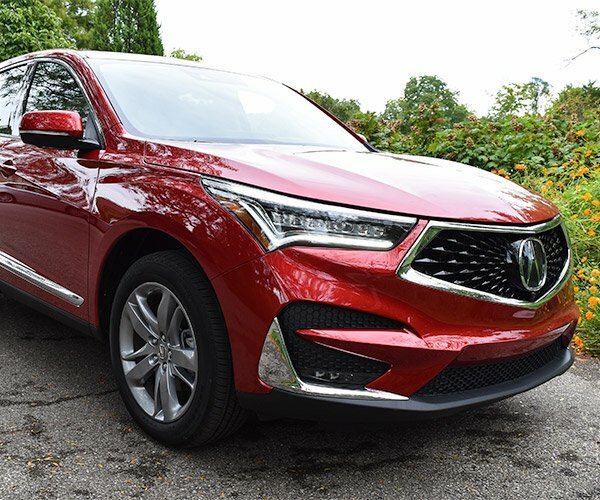 This compact crossover handles well not just in a straight line, but in the corners too, with less body lean than you might expect from a vehicle with 8.3″ of ground clearance. 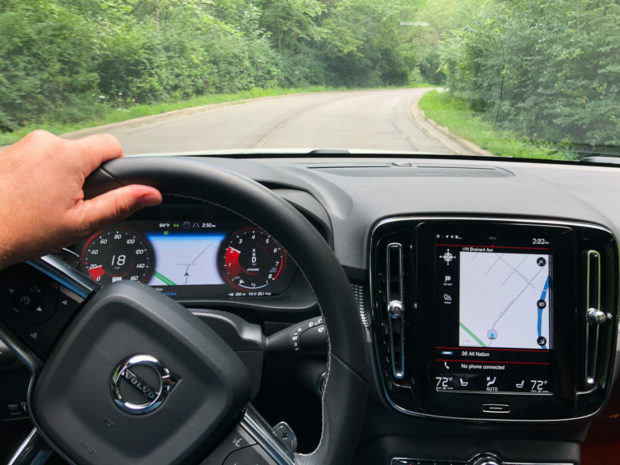 The shocks are tuned more stiffly than the typical grocery getter, and the electric power-assisted steering is crisp and direct, making a spirited drive in the XC40 a pleasure rather than a chore. Plus, the amount of assist can be varied depending on which driving mode you select. 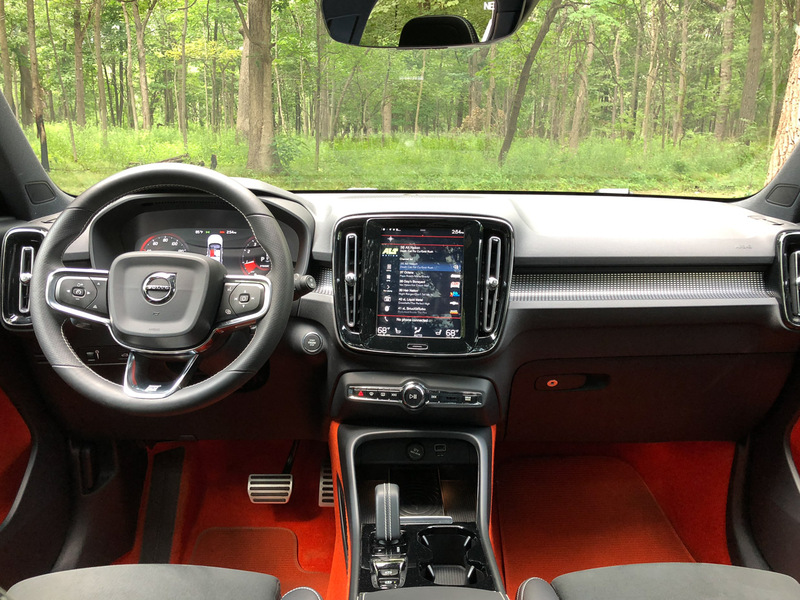 In addition to being able to dial in low, medium, or high steering assist, there are engine and throttle-mapping modes for comfort, eco, dynamic, and off-road driving. 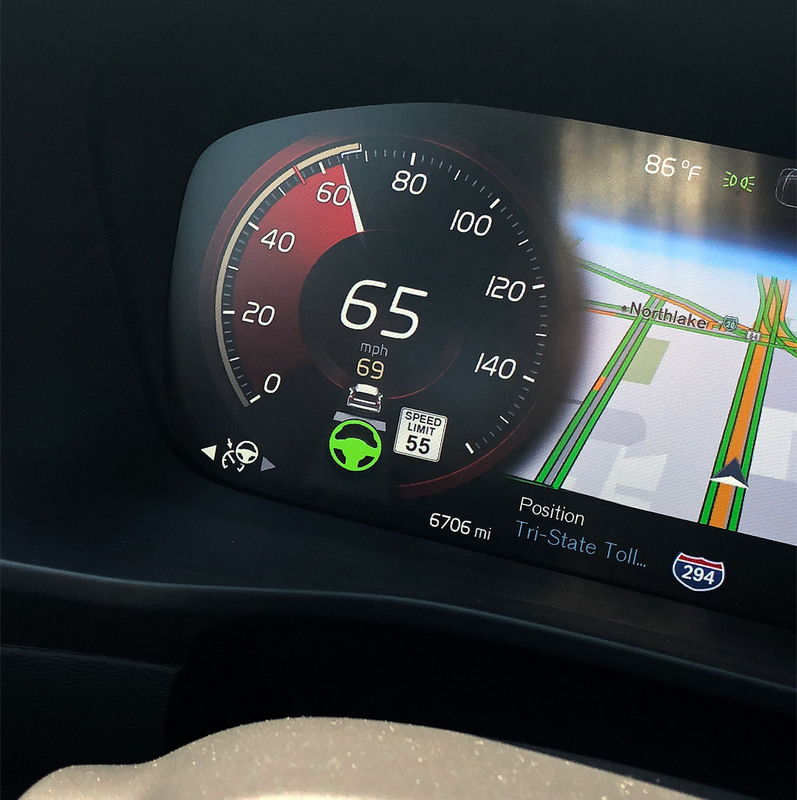 For those times when you want the XC40 to do the work for you, Volvo’s Pilot Assist tech can take on the task of managing your speed and helping keep you centered in your lane on the highway. Now it’s not fully-autonomous, but it does reduce fatigue substantially while driving on long trips. Beyond its design and handling dynamics, the XC40 is also a very practical little vehicle. 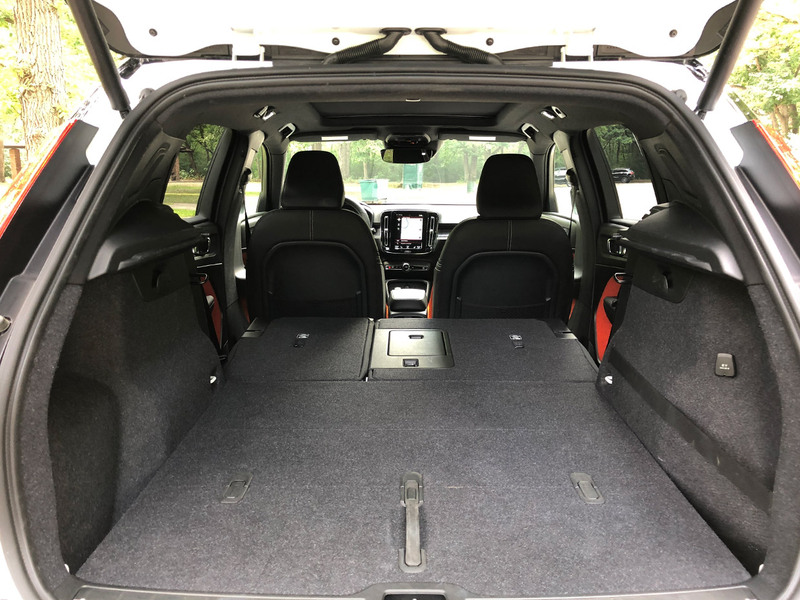 Even with the more powerful engine, it manages an impressive 31 mpg on the highway, and 23 in the city, and has enough space to comfortably carry 5 adults. 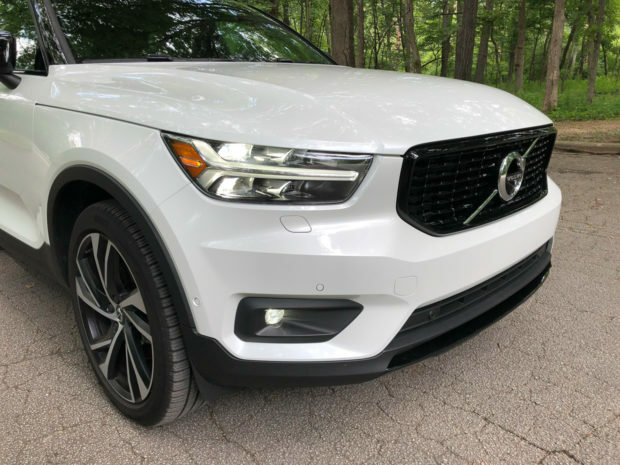 Of course, it wouldn’t be a Volvo if safety weren’t front and center, and the XC40 offers scads of safety features, including blind spot warning, cross-traffic alert, active bending lights, city collision avoidance, automatic braking after collision, oncoming lane mitigation, run-off road mitigation, and physical safety enhancements like side impact airbags, whiplash protection seats and headrests, and more. In R-Design guise, the interior of the XC40 is quite the showcase for modern styling. 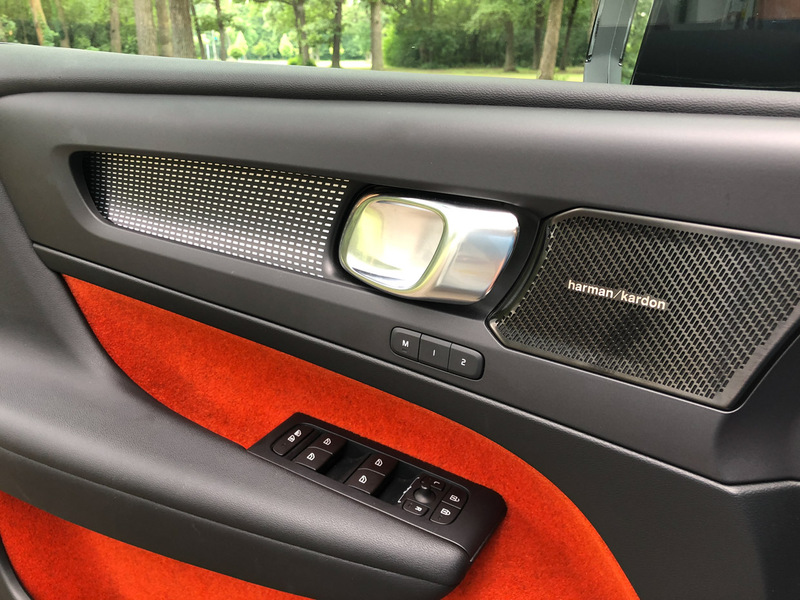 There are lots of slick, contemporary materials in use here that stand out from the crowd, along with real aluminum inlays, and even an optional orange carpet which covers not only the floors but the bottoms of the doors. While I love the high-contrast look, it’s the one place where the XC40 loses a bit of its pragmatism, as those floor mats are going to be very hard to keep clean. That said, I’d suggest sticking with the basic black carpet unless you’re fastidious about keeping your shoes clean, or willing to keep a stockpile of spare orange floor mats in your garage. 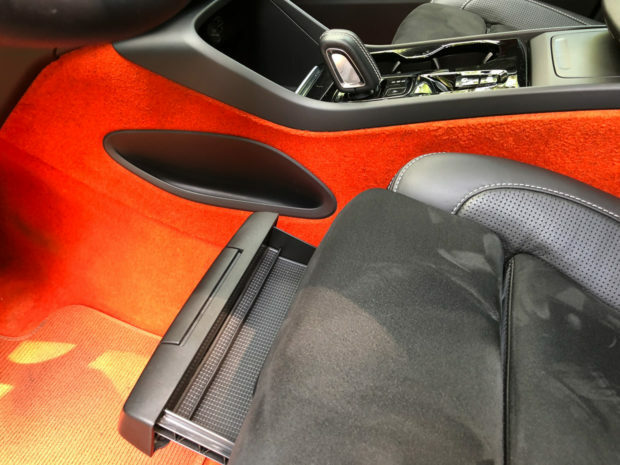 Still, I admire this bold design idea, and wish more automakers would give buyers carpet color choices. The nappa leather and nubuck suede seats in the R-Design are exquisite both in feel and overall comfort, and can be equipped with heat for chilly winter days. Sadly, cooled seats aren’t available. The cabin is loaded with thoughtful touches for everyday life, like door pockets that are big enough to hold a laptop, a hidden compartment under the driver’s seat, a fold-out purse hook on the glove compartment lid, lots of little cubbies, and even a trash bin in the center console that pops out for easy cleaning. The remote-controlled folding rear headrests are a great feature for improving visibility, and the rear seats can be folded with the push of a button. 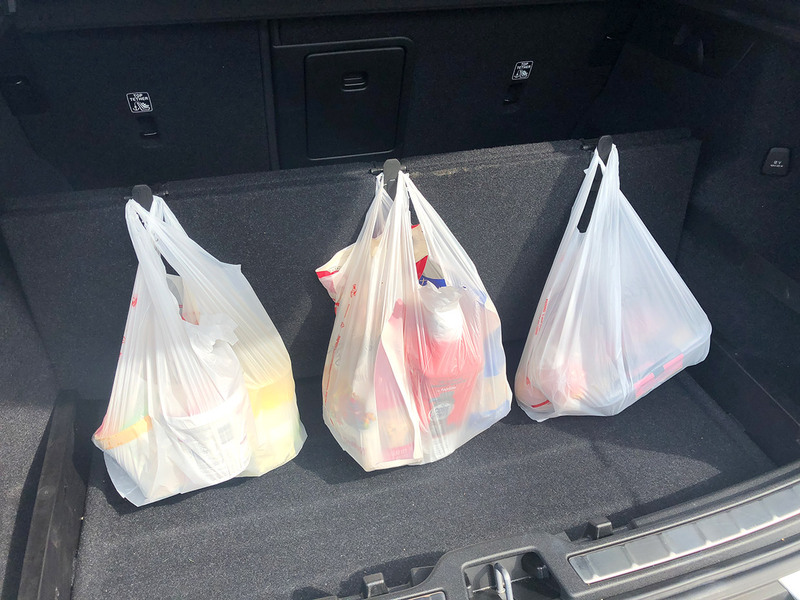 The cargo area in the XC40 is also quite useful, only offering up to 57.5 cubic feet of space with the rear seats folded, and an optional folding load floor, flips up 90 degrees to hold grocery bags on a trio of flip-out hooks. Volvo is also near the top of the game in terms of in-car technology. Their tablet-sized 12.3″ touchscreen is a marvel, with a smooth and easy to use interface that proves it’s possible to get away with a minimal number of buttons and knobs while still being usable. 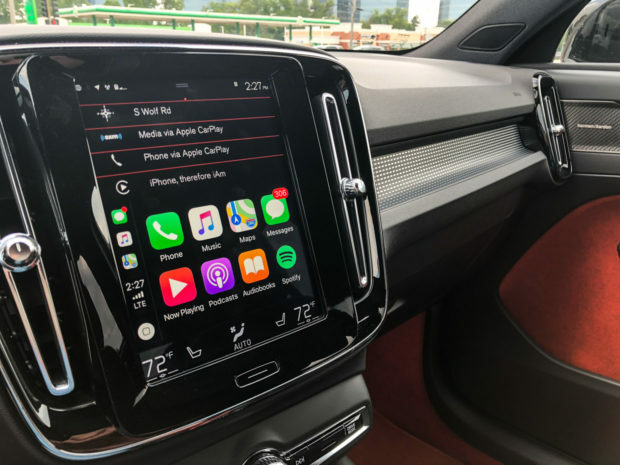 There’s also integrated Apple CarPlay and Android Auto, and a crystal-clear 360º video camera system. The upgraded Harmon Kardon audio system sounds great, and the navigation system works flawlessly. 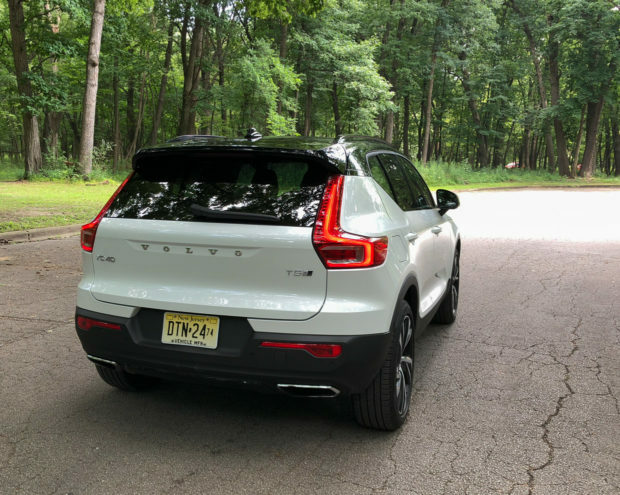 Sporting great looks inside and out, fun driving dynamics, tons of safety and convenience tech, and lots of smart and practical features for transporting people and their stuff, the Volvo XC40 hits a grand slam home run. 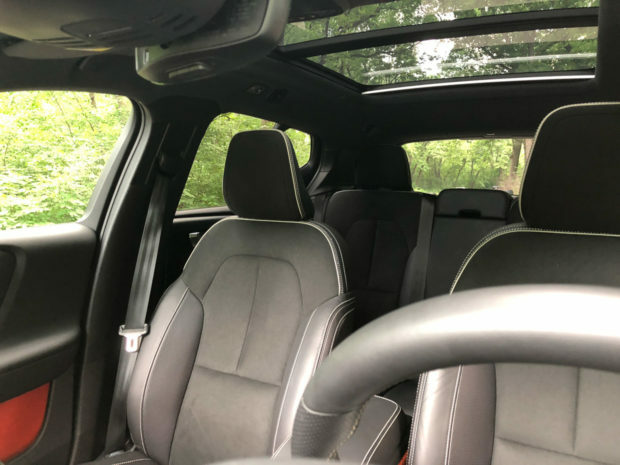 I’ve driven quite a few compact crossovers in recent years, and the XC40 has moved into my top slot, outpacing the Kia Sportage SX Turbo which had been my favorite for the last couple of years. 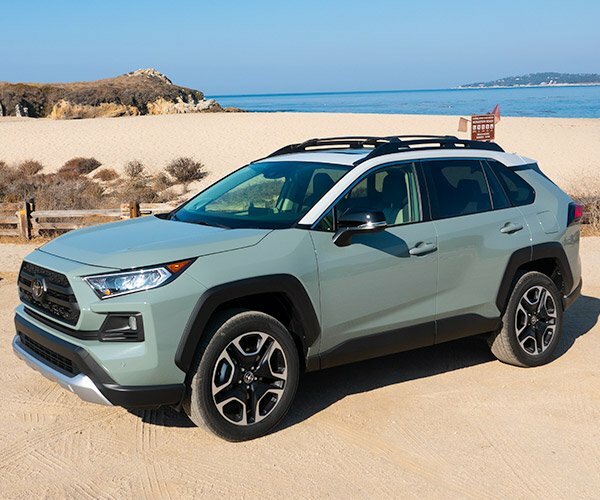 If you’re in the market for a compact crossover with style and much more, it should be high on your test drive list.